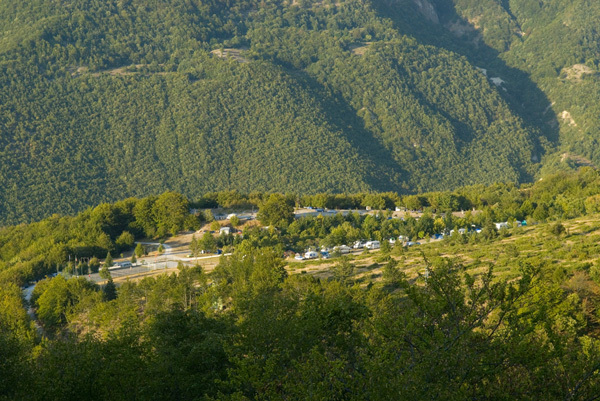 The Monte Prata Camping Site is in the very heart of the National Park of the "Monti Sibillini", at a height of 1237 m. overlooking the spring of the river Nera. It is located on a wide natural terrace on the western side of the chain. It's the ideal starting point for high mountain trekking, for anyone who wishes to meet eagles and other unique and protected species of fauna and flora. The camping ground is only ten minutes drive from Castelluccio di Norcia, one of the most important paragliding centers, and from Pian Grande, the "Grand Plain", known for the breathtaking beauty of its bloom. By the crystal waters of the river Nera you can enjoy trout fishing or just relax. In the small villages which cling to the mountain sides, gourmet can relish countless tastes of the past: pork meat, delicatessen, lentils, cheese, mushrooms, truffles, and many other exquisite products of the age-long tradition of the mountain people.